SCVHistory.com LW2326 | Film-Arts | One-Sheet (U.S.): Mel Brooks' Blazing Saddles (1974). 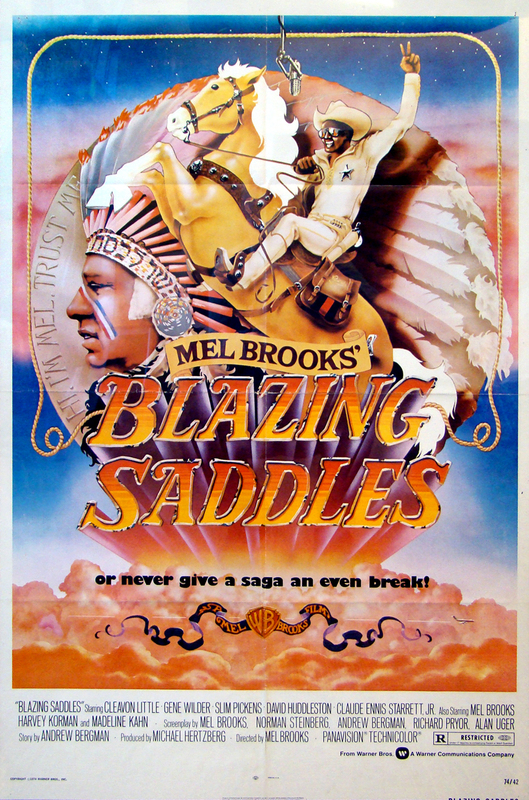 Original one-sheet movie poster (U.S.) for Mel Brooks' "Blazing Saddles" (1974). Nominated for three academy awards, director Mel Brooks' zany 1974 Western spoof "Blazing Saddles" was filmed on the Warner Bros. lot in Burbank, at Vasquez Rocks in Agua Dulce, and at Rosamond. A town where everyone seems to be named Johnson is in the way of the railroad. In order to grab their land, Hedley Lamarr, a politically connected nasty person, sends in his henchmen to make the town unlivable. After the sheriff is killed, the town demands a new sheriff from the governor. 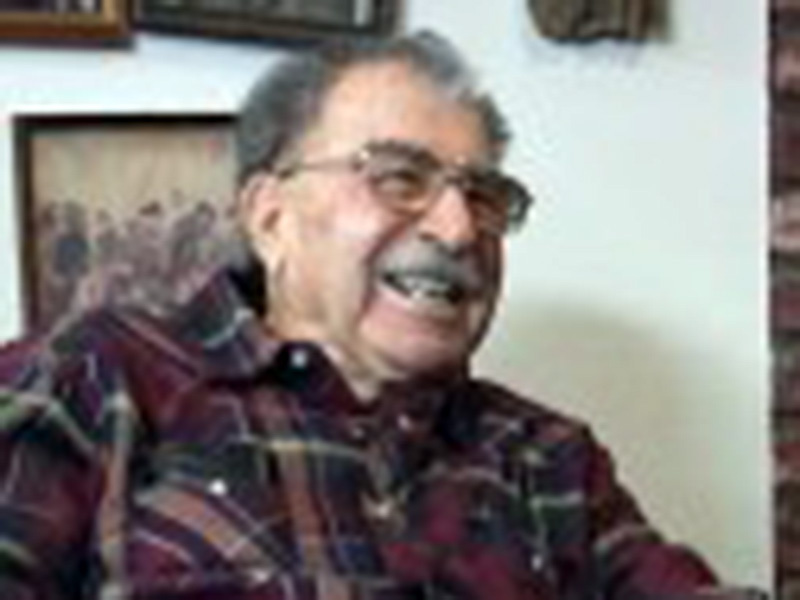 Hedley convinces him to send the town the first black sheriff in the West. Bart is a sophisticated urbanite who will have some difficulty winning over the townspeople. 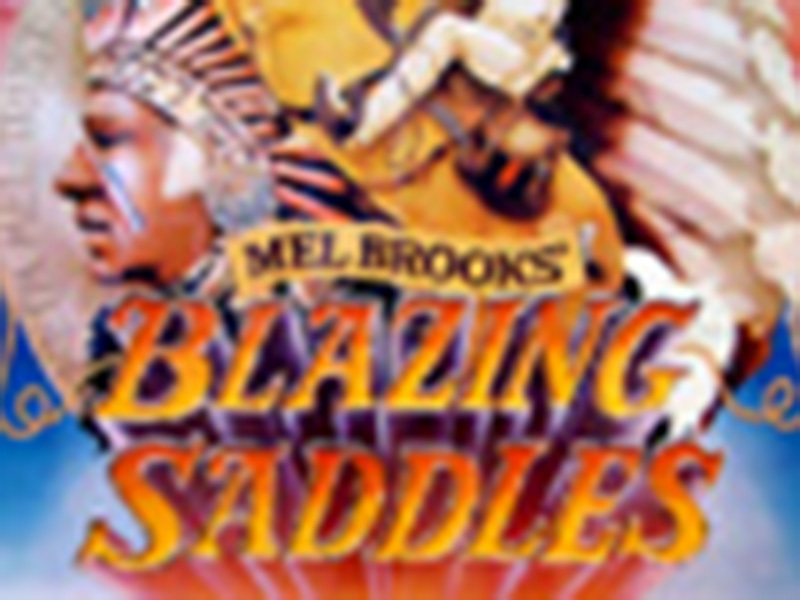 Produced by Michael Hertzberg and written by Andrew Bergman, Mel Brooks, Richard Pryor, Norman Steinberg and Alan Uger from an original story by Bergman, "Blazing Saddles" was originally released toward the end of 1974 and it did even better at the box office when Warner Bros., lacking a summer blockbuster the following year, re-released it in mid-1975. Also of note: 1930s-40s bombshell Hedy Lamarr sued Brooks and company for giving comedian Harvey Korman's evil bad-guy character the name of "Hedley Lamarr." According to Brooks, the real Lamarr was satisfied with an out-of-court settlement of only about $1,000. Credited actors, in order, include Little as Sheriff Bart; Wilder as Jim, The Waco Kid; Slim Pickens as Taggart; Korman as Lamarr; Madeline Kahn — nominated for an Oscar in the Best Supporting Actress category for her portrayal of the Marlene Dietrich spinoff, Lili Von Shtupp; Brooks as Gov. William J. Le Petomane, the Yiddish-speaking Indian Chief and an Aviator; Burton Gilliam as Lyle; professional football player Alex Karras as the giant Mongo; David Huddleston as Olson Johnson; Liam Dunn as Rev. Johnson; John Hillerman as Howard Johnson; George Furth as Van Johnson; Claude Ennis Starrett Jr. as Gabby Johnson; Carol (Arthur) DeLuise as Harriett Van Johnson; Richard Collier as Dr. Sam Van Johnson; Charles McGregor as Charlie; Robyn Hilton as Miss Stein, the governor's secretary; Don Megowan as a Big Man; Dom DeLuise as the producer, Buddy Bizarre; and Count Basie, as Himself, actually performing with his band in the dirt in Rosamond (although a recording was dubbed in). LW2326 9600 dpi jpeg from original one-sheet movie poster purchased by Leon Worden.